I wanted to thank the dozens of you who have stepped forward and shared your comments about your personal experiences with Michael Robertson on the Freepsire.com site. 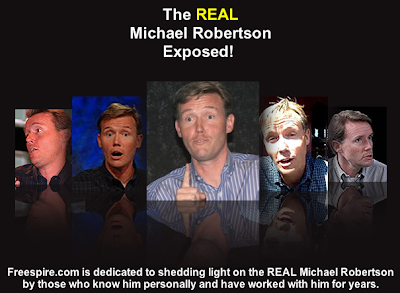 Having one site where people can read so many stories from those who have personally been involved with Robertson, is proving to be a great resource for those considering any kind of relationship with Michael Robertson. Most of the people I know wouldn't have even one or two people share such comments about them, and yet with Robertson, Freespire.com lists several dozen people with comments about him. As the saying goes, "Where there's smoke, there's fire." Freespire.com's mailing list has made it very easy for anyone considering getting involved with Robertson to first contact those who have had dealings with him previously. Our mailing list has grown to several dozens of names (with contact information) of people who prospective employees, investors, vendors and partners can contact before deciding if they want to have any dealings with Robertson. I have received emails from those of you who have said the site did in fact help you in your information gathering. Everyone I heard from ultimately decided to back away from dealing with Robertson after doing their research. I'm glad the site is helping inform those who are doing their due diligence on Robertson. If you have a Robertson story that you'd like to share at Freespire.com, just email us.